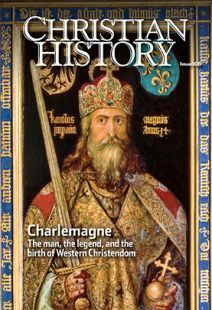 CH: This issue shows us how Charlemagne contributed to the idea of Christendom, the merging of throne and altar. Are we still in Christendom today? There are also people who want to resurrect a new kind of Christendom. They are frustrated that leftovers are all that remain. Some may not even realize that Christendom is gone and won’t return. CH: How then should church and culture relate today? Christendom recognized the power of the church, though it didn’t recognize it properly. It was a secular recognition of church power, trying to contain that power within another power. But—and I think this is more so with Charlemagne than even Constantine—it was antithetical to the power revealed in the Gospels. The loss of Christendom is a new opportunity. Look at the papacy. When we had Christendom, we had secular popes. Markus Wriedt said that now that the culture has become more secular, the pope has become more Christian. The church no longer needs to be accountable to the kind of politics present in Christendom. That frees it up to be a truly political force of its own. We need once again common life, common worship, common discipline, common teaching. Not uniformity, but something recognizable from place to place. CH: Two themes prominent in Charlemagne’s story are Christian-Muslim relations and the involvement of the church in education. Where are we on those themes today? DSL: Christians understand ourselves as transnational. We should not then try to make Islam fit within national politics. In that sense I am more than willing to concede Islam space as part of common decency. But there needs to be a better way of dialogue going forward. Islam, Christianity, and Judaism are all essentially social, with political significance. As far as education, I’m not sure Christians need their own educational institutions as much as new ways to educate people in the basic teachings of the faith. I tell people to ask their pastor if he or she knows their Myers-Briggs letters and then ask their pastor to explain the hypostatic union. I would argue that far more pastors know the first than the second. But knowing how the divine and human natures of Christ relate is more important for the future of the faith. Clearly we need some new ways of teaching. I’d love to see ecumenical schools emerge, places like the Scriptural Reasoning Project, talking from the orthodox heart of the faith, not its margins. We need to advocate for space for faith in the academic world; otherwise we will not have wiser, saner voices speaking of faith. When you police out confessional voices, that backfires. CH: How can the Christian tradition help us here? DSL: Besides the Epistle to Diognetus, I think we can learn from Augustine’s two cities in The City of God. Both maintained that our earthly politics are made relative in the face of God’s kingdom. That would be my criticism of Charlemagne—that his earthly politics were too central. D. Stephen Long is professor of systematic theology at Marquette University.